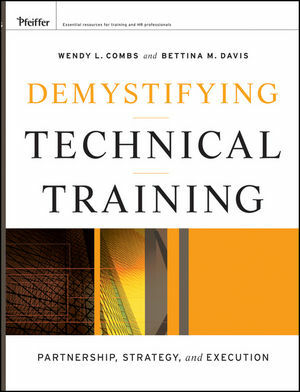 "Demystifying Technical Training is a must-read for CLOs, managers of training, instructors, and instructional designers. All who read it will gain critical insights into how to lower the cost and improve the efficiency and effectiveness of learning." —Wm. Douglas Harward, CEO and founder of Training Industry, Inc.
"Individuals interested in and accountable for deriving significant value from technical training investments will gain great benefit from reading this book and applying its wisdom." "Demystifying Technical Training is an essential, complete guide for any learning organization. The overviews and concepts are clearly stated, while the case studies and sidebars provide practical examples you can apply in your situation." "Considering the cost of acquiring and developing talent, why wouldn't all CEO/COOs insist on investing in people to improve results and reduce risk? This book demystifies the process of developing technical experts to increase the return on investment in human capital. Bravo!" "Technical training is a key to sustaining competitiveness in the new economy. Learn how to leverage and optimize its value in your organization through this wonderfully insightful and practical resource." "Don't be misled by the title—this book—while focusing on the often segmented world of domain specific job skills—provides guidance valid for the full spectrum of workforce learning from soft-skills to 'technical' skills." Wendy L. Combs, Ph.D., PMP, is a senior practitioner with an exceptional track record of building and developing global training teams to meet business goals and produce outstanding results. She previously worked in a technical training capacity at Intel Corporation, Cisco Systems, and Nortel Networks and is currently the vice president of Leadersphere. Combs is the coauthor of Instructional Design for Technical Training and The Targeted Evaluation Process. Bettina M. Davis, MBA, is an accomplished executive with domestic and international experience directing and overseeing comprehensive human resources, training, and organization development functions and programs across large corporate environments. Before taking on the role as director of talent acquisition and talent management at Tektronix Corporation, she led employee training, including technical training, for Intel IT worldwide. Chapter 1: What Is Technical Training? The Complete Training Suite for Technical Experts. Technical Training and Related Activities. Summary: The Power of a Common Language. Chapter 2: Challenges and Opportunities for Technical Training. Lack of a Common Understanding. Perception Versus Reality of Technical Training. The Need for a Strong Lobby. The Impact of a Declining Economy. Ownership of Technology and Enabling Activities. The Role in Continuous Improvement Initiatives. The Tension Between Two Core Competencies. Integration of Technical Training into Talent Management. Availability of Career Paths for Technical Employees. Skills Mastery Over the Course of a Career. Summary: The Value Proposition for Technical Training. Chapter 3: Differentiators of Technical Training. Granularity of Content and Audience Size. Summary: The Potential of Differentiators. Chapter 4: Stakeholders of Technical Training. Managers Want Skill Gaps Addressed. Technical Leaders Need Support for Technology. Technical Experts Want Accurate Content. Human Resources Partners with Training. Steering Committees Align and Govern Training. Identification and Classifi cation of Stakeholders. A Team Approach to Stakeholder Engagement. Summary: The Requirements for Collaboration. Chapter 5: Technical Training Strategy. Capabilities to Execute the Strategy. Summary: Setting the Stage for Execution. Chapter 6: Getting the Technical Training Agenda Funded. Considerations in Advance of Funding. Identifying Business Reasons for Funding Technical Training. Understanding What Executives Are Looking For. Defi ning Accountability and Ownership. The Cost of Technical Training. Technical Versus Non-Technical Training Costs. Aligning Funding to Evaluation Outcomes. Summary: The Art and Discipline of Budgeting. Chapter 7: Staffi ng the Technical Training Organization. Structure of the Training Function. Project Management Skills for Discipline. Relationship Skills for Stakeholder Engagement. Recruiting Sources for Technical Training Professionals. Managing the Technical Training Team. Summary: Hiring and Development in a Nutshell. Chapter 8: Technical Training Analysis, Design, and Development. Designing the Technical Training Portfolio. Summary: Stakeholders Participate Throughout the Training Life Cycle. Chapter 9: Marketing of Technical Training. Hurdles to Marketing Technical Training. Reading the Signs of Diminishing Value. Marketing Principles Applied to Technical Training. Defi ne the Target Market. Choose the Right Marketing Tools. Common Sense and Marketing Technical Training. Summary: The Prospect of Marketing Technical Training. Chapter 10: Technical Training Delivery and Evaluation. Preparing Instructors for Training Delivery. Modes of Technical Training Delivery. Classroom, e-Learning, and Blended Training. Social Networking and Collaborative Technology. Transfer of Training to the Job. Evaluation of Technical Training Programs. Summary: Learning from Technical Experts.